(1987) graduated from the National Academy of Dramatic Art in Warsaw, where she now works as a lecturer at the Department of Theatre Studies. Deputy chair of the Polish Association for Theatre Studies and member of the journal Teatr’s editorial team. Along with the present journal, her articles have appeared in Didaskalia, Dialog, Performer, on dwutygodnik.com, in Svet a Divadlo, Yorick, Rzut, Art & Business and in academic monographs. The participatory aspect of the creative process is among her main interests (practical as well as research). An urban performer and author of urban social projects, she has collaborated with the Rimini Protokoll collective and with Edit Kaldor on participatory theatre projects. She has worked as an assistant for director Erling Jóhannesson. She is working on a doctoral dissertation about the current situation of craft in theatre. 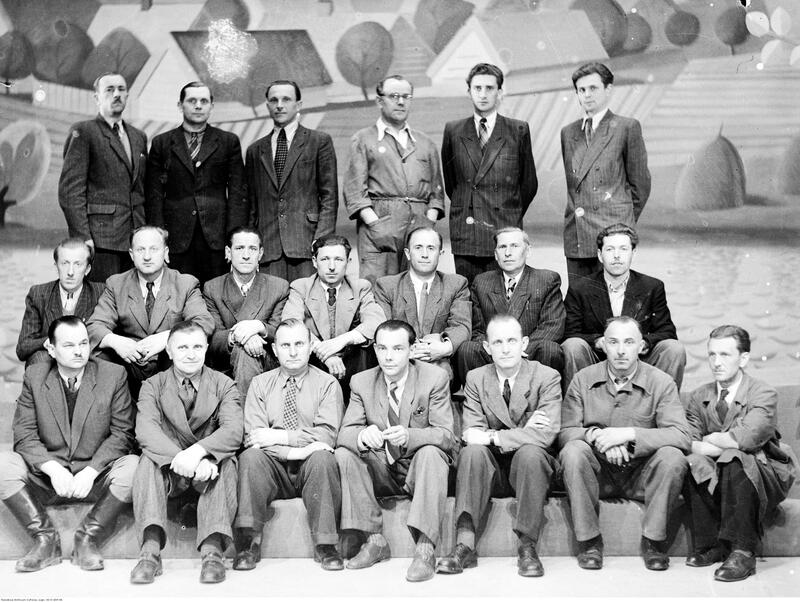 Technical staff in front of Władysław Daszewski's set design for CRACOVIANS and MOUNTAINEERS, directed by Leon Schiller, premiere: National Theatre in Warsaw 1946. Photographer: Edward Hartwig. Collection of the National Digital Archive. The author takes as her starting point the assumption that institutional theatre in Poland since 1989 has been undergoing a secret, non-systemic transformation from the Fordian to the post-Fordian model (the latter being peculiar to late capitalism). The author argues that, although little has been offered by way of substantial reflection on the subject, the changes in question contribute to the exploitation of the lowest-earning staff, leading towards the gradual extinction of craft in theatre. The article aims to identify systemic reasons for existing dysfunctions, such as inadequate self-knowledge within the organization, institutional disintegration and structural opportunism. The findings presented here are based on qualitative research undertaken by the author: interviews with more than eighty craftspeople, technicians and stagehands, both employed and retired. I first came across theatre craftspeople in 2014, at the Miniatura Theatre in Gdańsk, while working on a Polish-Icelandic project, Blue Planet. Blái hnötturinn[Blue Planet], a play by Andri Snær Magnason – a well-known children’s author, environment activist and in 2016 a presidential candidate – considers climate change in a political context, demonstrating that democratic mechanisms are as likely to be used as instruments of protection as of destruction, when it comes to the environment. Working as an assistant to director Erling Jóhannesson, I realized that he found it essential to stage Magnason’s play in Gdańsk. Inspired by the history of the Solidarity movement then its disintegration following the fall of Communism in Poland, Jóhannesson decided to adapt the globally relevant issue of climate-change politics to the Polish context and ask what issues Poland has today with democracy. Just after work on the production got under way, however, it became clear that a crisis of democracy and the tense atmosphere at the theatre institution hosting us would be our main concerns. Leaving the Miniatura Theatre’s impressive history to the side for the time being, and its succession of artistic directors over the years (I’ve described the theatre’s personnel predicaments in another article1), it must be said that since 2012 the theatre had been undergoing conspicuous change. The new managing director , Romuald Wicza-Pokojski, appointed in 2011, had put much effort into restoring the theatre’s reputation and attractive image. Drawing on his experience in alternative theatre,Wicza-Pokojski abandoned long-term production planning and set about securing additional funds for project-based work: the Blue Planet project, funded by the European Economic Area (EEA) (as part of the so-called Norway grants) was one example of this. He expanded the theatre’s scope of activities to include performative readings and workshops for parents. He also rebranded the theatre, completely overhauling its visual identity. A boost in attendance and reputation was reflected in the fact that the Miniatura Theatre was nominated for awards in several municipal competitions,2 with the theatre’s status rising swiftly to among the major arts institutions in the region. As I observed while working on Jóhannesson’s production, this success was at odds with what went on within the theatre. Technical staff and craft workshops had not been consulted while the modernization process was in progress. One may find that surprising, bearing in mind Wicza-Pokojski’s social-activism streak, manifested in projects aimed at socially and economically disadvantaged groups. In his capacity as the director of a municipal institution, however, Wicza-Pokojski failed to utilize this experience and engage his lowest-paid staff in the transformation process. Unaware of the full story behind the changes, Jóhannesson – who also has roots in alternative theatre3 – suggested a working model that was natural to him, based on a collective process in an atmosphere of mutual trust, with mutual appreciation between craftspeople and the director regarding their creative abilities. To his surprise, some craftspeople and stagehands were extremely reluctant to work together in this manner at first. To translate to him not just the literal meaning of the staff’s words but also ulterior motives behind their passive attitude, I had to discover and comprehend the profound conflict between ‘top’ and ‘bottom’ – that is, between the ‘new’ management department and the ‘old’ department comprising craftspeople who work on stage design. The two groups held wildly divergent views on publicly funded theatre. Suspecting that the Miniatura Theatre was not an isolated case, after the project came to an end, I searched for other theatres where resistance was encountered from their technical workshops to attempts at making the production model more flexible. I interviewed over eighty craftspeople and technicians, both active and retired, employed at publicly funded theatres including puppet and musical theatres. This group comprised metalworkers, carpenters, modellers, painters, costume makers, puppet makers, shoemakers, shoe-uppers makers, upholsterers, make-up artists, wig makers, as well as sound and light technicians, dressers, stage foremen, stage assemblers and prop masters. I also spoke to several technical directors who coordinate all workshop tasks within a theatre. The study was conducted anonymously; in keeping with the personal-data protection act, I’ve left undisclosed the names of the individuals quoted. With one exception, names of artists mentioned by the craftspeople have also been left undisclosed, as is information about the interviewees’ workplaces. It needs to be emphasized that, though I endeavoured to choose theatres for this study that are diverse in terms of location, size and stature, I wasn’t guided strictly by the criterion of representativeness. I employed qualitative research methods, collecting and analysing data in keeping with the guidelines of grounded theory.4 As recommended by the theory’s proponents, I didn’t begin by formulating hypotheses or with an overview of the subject according to published sources – which are few and far between in Poland, in any case, and focus almost exclusively on technical aspects of craftsmanship in theatre, leaving aside social issues and questions of organisation. Instead, I took data as my starting point. The data was assembled by means of unstructured interviews, observations in the workplace and of interactions between individuals in workshops. (Most interviews were carried out during the interviewees’ working hours and in their workplaces.) Issues and behaviours I came across during my visits were decisive in determining the direction of my research and its underlying theoretical perspective. At first, I followed an intuition that Bruno Latour’s actor-network theory may shed interesting light on the study of craft in theatre. Hence, I was interested first and foremost in how craftspeople approach inanimate matter, and in the role material processed by the team had to play in communication between different production departments. In time, however, this theme became less important: the data collected and the craftspeople very decisively pointed me towards issues of employment and manual-labour management. The actual start of my work was practical experience gained at the Miniatura Theatre in Gdańsk in 2014. This was followed by study visits (then left unrecorded) to workshops of the National Theatre in Warsaw. During this period, I also interviewed retired craftspeople, graduates of the renowned State High School for Theatre Craft (1945–1968): these conversations were subsequently described in a piece of reportage for the Teatr monthly.5 I began recording interviews in theatre workshops in January 2016 – this phase of my study remains in progress. The present article is therefore not a ‘finished theory’ in the sense elucidated by Barney Glaser and Anselm Strauss.6 In a previous article, I claimed to have attained the so-called theoretical saturation; however, the fact is that at that time I understood the phenomenon too casually as a ‘repetition of describes events, actions and / or statements’.7 During successive interviews or chance encounters with craftspeople, I occasionally come across data revealing a new, important aspect more so than changing my established view of the matter: in Glaser’s words, ‘new properties of the pattern’8. Data included in the present article and their interpretations must therefore be taken as a report on a certain stage in the research process. I hope my study will both help identify systemic reasons behind tensions observed in Gdańsk and play a role in bringing to light a more complex image of publicly funded theatre in contemporary Poland. The ambition of the present text is to overcome the unjust stereotype of a craftsperson or technician as a homo sovieticus, backward and hankering after the past. Instead of focusing on what the interviewees lack – the artist status – my interpretation of their statements emphasises assets they bring to theatre: above all, work ethics which depend on teamwork and frugality with materials. Another crucial context is the web of relations established between various human and non-human actors in the production process. According to art historian Suzi Gablik, ‘Whereas the aesthetic perspective oriented us to the making of objects, the ecological perspective connects art to its integrative role in the larger whole and the web of relationships in which art exists’.12 I follow Gablik and my interlocutors in assuming the ecological perspective. At the same time, after Andri Snær Magnason, I try to present ecological facets of the production process as inseparable from social and economic developments. At the same time, I need to be aware of the perils of romanticizing craft. That romantic approach is partly due to theatres, specifically to their PR departments. In the wake of a new cultural trend manifesting itself in the marketable form of craft beer, craft ice cream or crisps, theatres use the image of a craftsperson as a vehicle for the ‘back to the origins’ utopia (promotional films and photo exhibits depicting the people ‘behind the scenes’13 are but random examples of this). In addition, theatres present workshop staff as their link with the natural world, in that craftspeople ostensibly come into immediate contact with matter. To avoid making a similar mistake, after I have presented findings of this study (largely made up of craftspeople’s critical views of institutions that employ them), I take a step back and offer perspective by placing their remarks within the horizon of expectations: ideal models of theatre which provide my interlocutors with an occluded, selective point of reference. These models frequently take the form of legends, passed on from generation to generation. Promotional film featuring craftspeople, Arnold Szyfman Polski Theatre in Warsaw. Most of the theatres I visited have undergone major refurbishment in recent years. If, however, those refurbishments did not extend to certain parts of the building, by design, they definitely did not extend to craft workshops. The result is a stark contrast between formal spaces, such as foyers, offices and guest rooms, and the workshops. Thus, before anything else, I asked my interlocutors about their working environment. For years, the puppet maker A. has been sharing his workshop with a carpenter: ‘I would like to have a bit of room that is dust-free, noise-free. A carpenter sawing or sanding wood makes noise of up to a hundred decibels.’ Asked whether he informed the management of his need for a separate room, A. replies: ‘They told me to wear a mask and headphones for work, but that’s not me. I need to hear the chisel move against the wood, I want to smell the wood. When you carve, you must stay focused, stay in close contact with the matter’. 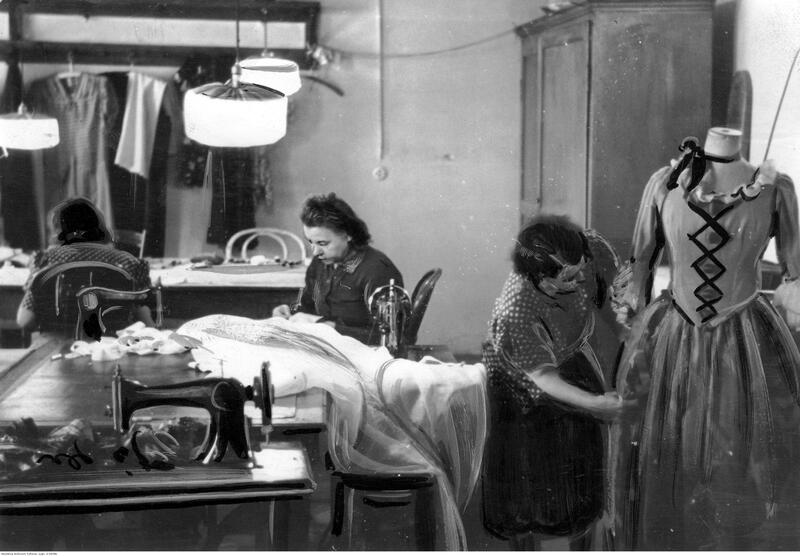 Costume Workshop at the German Theatre of Warsaw, 1943. Photographer: Jerzy Łuczyński / collection of the National Digital Archive. The workshop was mouldy and rat-infested: not only were rats running all over the workshop, but they also made their way to the musicians’ dressing rooms. I made the bookkeeper come down to our workshop, so she could see. This was the first and only time she’d been there. That was when she gave us permission to buy fungicides, and paint for our room. I suggested that we scatter milled rock tiles underneath the floor, to drive the rats away, but the bookkeeper wouldn’t allow that. The new building is completely unsuited to our needs. The rooms may be interesting from an architect’s point of view, but none of the designers took any interest in the type of work that would be done here. Not a single ventilation fan across the whole floor, not even windows that open; and we’ve got glues and paints here, we spray, sand and polish. Windows were supposed to be replaced by air conditioning, but that’s good for an office, where there are no toxic fumes. Also, the walls between rooms are not insulated properly, and we use machines, so we disturb one another. And the thing that surprised us most was that each of these rooms had one power socket, or none at all! D. asked why the management of the institution under consideration did not demand the designs be amended at the planning stage – given that they failed to meet basic health and safety standards – she replies: ‘I was unable to untie that Gordian knot: how did it come to this, why weren’t there any talks between designers, contractors, management and staff. In any case, for a long time we weren’t even sure if workshops would be preserved at all after the move’. Low participation in the decision-making process by rank-and-file staff prevents many Polish theatres from becoming ‘learning organizations’16 – not because they fail to keep up with trends in management, or because they can’t afford the latest technological innovations, but primarily because they do not take advantage of knowledge available within the organization and essential for self-improvement. In her comment, D. inadvertently touched on an issue fundamental to the ‘top-bottom’ relationship: craftspeople in theatre represent dying professions, providing the administration with a convenient pretext for failing to invest in these members of staff. As the Polish economy switches to the capitalist model, publicly funded theatres in the country, lacking a comprehensive vision of reform,17 make secret, uncoordinated attempts to adjust to requirements of the new post-Fordian system – including fragmenting production and outsourcing tasks to reduce staff. Since the beginning of the political and economic transformation in 1989, theatre management have been inconspicuously closing workshop posts, usually when craftspeople retire. Retired staff members are re-contracted for more demanding projects; some tasks are delegated to craftspeople from other theatres. Many theatres no longer have a full set of workshops, and in most cases workshop staff numbers have been significantly reduced. Only two institutions included in the study have been able to keep all their workshops and a large number of jobs, thanks to the response from trade unions. However, even those two theatres failed to come up with a way of circumventing the market mechanism that restricts the in-flow of new employees who would fill jobs preserved for the future. In the past, the path into theatre led through private workshops where aspiring craftsmen learned the ropes of their trade – but the 1989 breakthrough, after which markets opened up and Poland was inundated with cheap clothing, brought about the downfall of traditional crafts such as millinery, shoe-making, corsetry and upholstery. Many tertiary schools of handiwork, whose graduates had filled the workshop ranks, were closed for the same reason. Regarding the few professions where institutional forms of education remain in place (secondary art schools, tailoring and electrical vocational schools, tertiary schools for make-up artists and sound producers), while theatres do admit students for unpaid apprenticeships lasting several weeks, few apprentices are willing to stay on, deterred above all by very low pay. Most theatres pay minimum salaries or little more than that. Many institutions have reduced jobs for craftspeople to a part-time basis, which in practice means monthly earnings of 700 zlotys [less than 200 euros]. Staff frustration is exacerbated by ever-widening earnings gaps between craftspeople and artists. The metalworker I. remarks: ‘Almost ninety people working in our theatre earn less than 2,300 zlotys of basic salary a month. A well-known stage designer can get a hundred times as much for a production, so the pay gap is huge’. A few words of explanation need to be added here: not even the best-known stage designers in Polish theatre are paid as much as I. maintains. It is common knowledge in the theatre world that they are paid up to twenty times the monthly salary of a craftsperson – which is still a substantial disproportion. In his comment, I. was alluding to a specific artist who worked on the production in several capacities – stage design was one of them, and he was to be paid the amount cited for all his tasks. When they speak, craftspeople often resort to allusion: it enables them to point to a problem without naming names, protecting them from being accused of disclosing confidential information and acting to the theatre’s detriment. Another reason for the lack of applications to work in theatres is their poor organizational culture: an absence of motivating systems, and no support for employees seeking to improve their skills. The acquisition of new skills enabling them to compete on the job market is an investment craftspeople have to make themselves. Given that most can’t afford that investment, after several years they are doomed, as it were, to theatre. Zofia Mrozowska as Electra and an anonymous lighting technician. Records of a production of J.P. Sartre's THE FLIES, directed by Erwin Axer, set design by Jan Kosiński, National Theatre in Warsaw 1957. Photographer: Edward Hartwig. Collection of the National Digital Archive. One result of the growing earnings gap and ever-greater disparities in employment forms – a full- or part-time job on one hand, single-job contracts on the other – is the breach in the unified front previously maintained by trade unions with a view to influencing employment politics. In the theatres included in this study, trade-union membership has shrunk as older members of staff retired: there is little interest in joining among newcomers. The fact that trade unions have become overly political (and poised too near the political right18) is usually given as the reason for not joining a union or for terminating membership. Another is that unions have next to no leverage concerning the staff’s working conditions. Thus the absence of an organized, shared course of action aimed at saving a workshop is not simply a manifestation of the craftspeople’s passive attitude or the result of ideological division: it is also due to systemic change. As they began to switch to the post-Fordian system, theatres became burdened with an extinction debt. This ecological term, for the extinction of a species that occurs some time after the factor causing that extinction began to operate, is apposite for describing the extinction dynamics in the craft professions. In nature, the extinction of a species caused by a disruption in the environment such as habitat destruction, climate change or invasive species, may take place up to a century after the new balance has been achieved.20 Although it seems at present that the process of cutting workshop jobs has come to a standstill, cut to the bare minimum, I would be inclined to argue that we are dealing here with a protracted extinction process which has in fact hardly been stopped at all. According to one technical director I interviewed, economic and social disparities between craftspeople will be the next stage in this process. Only a few professionals – the best qualified – will survive on the market as freelancers. The rest will be downgraded from craftspeople to working as stage-design technicians, undertaking small repairs on completed set aspects. Early signs of this internal stratification are already noticeable, seeming to only lessen the pace of extinction. Theatres which no longer keep their own workshops are the primary source of extra work for craftspeople from other theatres. One could therefore argue that some craftspeople benefit from closing workshops, in that it enhances their position on the free market. One of Poland’s last remaining representatives of a certain theatre trade secures as much as 60 per cent of his monthly income through jobs for theatres in which his profession is no longer present on staff. Similar situations obviously play a role in the disintegration of professional craftspeople as a group: the benefits of being indispensable offer no incentive to work towards improving the situation, as that would mean breeding competition for oneself. And yet, the strategy of striving to become a monopolist might prove short-sighted: once the monopolist retires, that profession will cease to exist in theatre. It is true that the craftsman in question confessed he was looking for a successor so he could pass his work realm on to someone reliable, and maintain the monopoly. Still, there is significant risk that he cannot train a successor in time for retirement – not least because instead of looking for apprentices he spends his time doing extra jobs. One recalls the dog in the manger who keeps goods it does not want to himself so that others can’t benefit. Despite these early symptoms of internal stratification, raftspeople at theatres in smaller cities remain uniform as a group, both economically and in terms of status. They are a relic of the old, Fordian production model. At the same time, they are affected by implications of converting to the new model. One could therefore say that publicly funded theatres in Poland (and many institutions of the Polish state, for that matter) are hybrids combining features of the old and new production models. The result holds organizational dysfunctions galore. Relations between craftspeople and stage designers are the most glaring example of these dysfunctions. 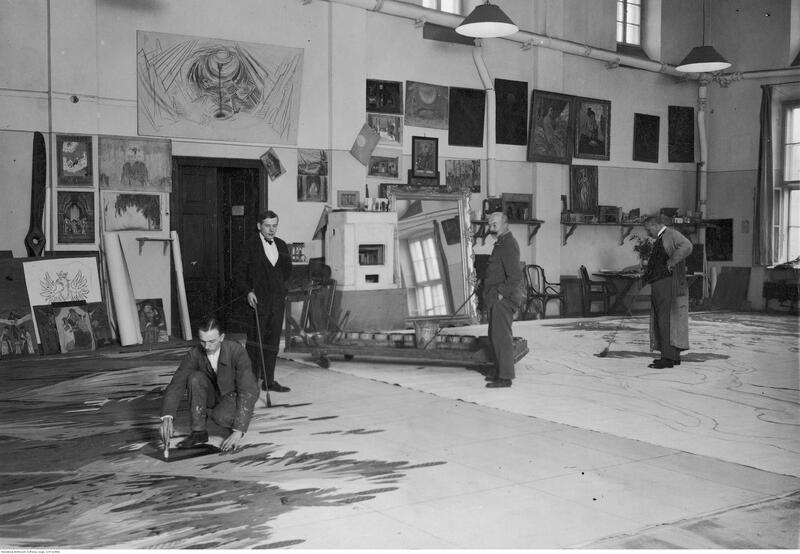 Stage designer Wincenty Drabik (second from left) at a painter's workshop, 1925. Collection of the National Digital Archive. All young ones do their stuff on computers these days. I understand that a stage designer will take ten things, but make one of their own – I can understand that. They have their own vision, they can look for inspiration. But the worst thing for me is when someone takes a completed thing from a fashion show, one to one. And all they say is: let’s do it in red, not in rainbow colours. To me that’s not a stage designer. Asked what makes designers disregard or breach the rules of working with theatres, many craftspeople point to stage designers’ excessive workload and their mobility. It’s not unusual for designs to be received by email and discussed over the phone. Few theatres still hold project discussions during which managers of all craft workshops are present. Such discussions used to be compulsory, and enabled workshops to plan their spending on materials. Because designs are absent and the practice of discussing them together nonexistent, stage designers habitually exceed production budgets. It often happens that we need to make alterations because someone got the wrong end of the stick. This costs the theatre a lot of money: our money, public money. To me that’s as if someone threw bread out the window. This would be unthinkable in Western theatres where, if a stage designer exceeds the budget, they pay out of their own pocket. The people who used to be in charge of our workshop passed this attitude on to me: don’t go crazy, don’t get out of the line you’ve been assigned. Obviously the theatre salary is at the very end, and the [technical director’s] trust, that if you’ve got a job on the side, don’t report it, I trust you to do that job and [your job here], so I can safely put this or that on the table without causing a row. There is consent. Asked whether he was a trade-union member, X. replied he couldn’t remember: ‘I honestly don’t know. No, I am, but [the fact that I can’t remember] tells you something: I can say that my situation is stable, that so far I didn’t need to ask for help, complain or go to court – but if that happens, it’s good that [the unions] are there.’ ‘That’ did happen to X.’s colleague from the same workshop: he was fired from the theatre by new management, though he was a trade-union board member – indeed, he was fired for that reason. He was only reinstated to his post following a court case, in accordance with the law which grants protection to trade-union members sitting on boards. Despite that, X. claims he is happy with the new management. Another reason for opportunism is that stage designers play the crucial role of a link between craftspeople and the theatre milieu and the job market. Unlike the artistic department and stagehands, workshop staff seldom tour with the theatre during guest performances or festivals – which means, among other things, that their knowledge of workshops in other theatres is limited. Stage designers, being mobile freelancers, are a valuable source of this information and a potential employer. It pays to have good relations with a stage designer: through her, a craftsperson can be offered an open job at a different theatre, and thus be granted the privilege of mobility which entails being at least temporarily promoted to the ‘creative class’ (to use economist Richard Florida’s term). Stage designers display uniquely Polish characteristics of that class: they are constantly pressed for time, as their pay does not balance the costs of self-employment and are insufficient to cover health insurance and pension contribution.23 When a stage designer works in several theatres simultaneously (and on sets for commercials and soap operas and photo shoots), one survival strategy is to delegate part of her tasks to craftspeople down the ladder. As an aside, the fact that management ignores the ministerial directive specified above demonstrates that the theatre production model is being subordinated to a work style peculiar to late capitalism – and that this process goes on in secret and outside the bounds of law. This new modus of work – eternally ‘in progress’ - allows a concept rather than the concept’s technical and artistic realization to be presented as proof that a job had been completed. Care and attention to detail are valued less than the ability to adapt swiftly and make low-cost adjustments. This points us towards stage designers’ second survival strategy: replacing handmade objects with ready-made products bought at online auctions or second-hand shops. A craftsperson is only expected to adjust these products to what is needed on stage. The carpenter M. observes: ‘I get the impression that we do nothing but work on IKEA lately. IKEA pieces come in and we adapt them for the stage. We don’t do anything from scratch.’ W. remarks that the strategies of borrowing forms and ideas result in the decay of aesthetic diversity: ‘People used to go deep into a given kind of theatre, look for new forms of expression within a given convention – not like now, when they have a casual go at everything, and the result’s always the same’. Given perpetual time shortages, though, this strategy is efficient in that it makes work on a production much quicker. For one thing, the theatre can do without a stage-design project (though it is still required by law); second, talks with technical directors become much shorter; the ‘trial and error’ phase – error being an indispensable feature of prototype stage design, that is, of design made from scratch – also shrinks significantly. It would seem that buying costumes in second-hand shops is at least true to the ecological approach. The shoemaker N. disagrees: ‘A stage designer buys ten pairs of second-hand shoes and tells the actor to try them on afterwards. This way, half of the bought costumes often end up in the warehouse’. While Kuba Szreder isn’t blind to opportunistic behaviour among contemporary artists – the result of being forced to ‘grab every opportunity as long as it helps you survive’25 – he is, in a way, inclined to excuse such behaviour: Szreder describes the readiness of the creative class to make sacrifices for the sake of their projects and ‘work beyond their capabilities’.26 In so doing, he overlooks those on whom the artists’ opportunistic attitude rebounds: their subcontractors. Szreder argues that ‘The more fiercely people working in art are forced to compete with one another, the quicker they adjust to the requirements of institutions, or people who regulate access to opportunities’27 – but is oblivious to the fact that institutions, too, adapt to freelance artists’ requirements by evading regulations and taking advantage of their own staffs. In theatre, the difference between the precarisation of the lowest earners and the self-precarisation of arts professionals – a distinction Szreder mentions – is that stage designers willingly consent to market laws, receiving in return their reputations or visibility. Asked about being forced to do a stage designer’s work, the carpenter K. remarks: ‘When a stage designer gets an award, I often wonder who the award is really for’. The majority of craftspeople interviewed for this study hold a very low opinion of the aesthetics of contemporary Polish theatre: they view these aesthetics as derivative, citing as evidence the practice of adapting IKEA furniture, designs that plagiarise photos from fashion magazines, mindless imitation of stage design seen in other theatres regardless of the costs of labour and materials. Asked what kind of theatre appeals to them, craftspeople usually take their own experience of working on a given production as their initial reference point – in other words, they make no distinction between the aesthetics of a production and the production process, which includes interpersonal relations established between them and the other ‘actors’ in that process. In that sense, they don’t regard theatre as an autonomous value. This is crucial from the point of view of psychology: by stressing that the value of their work depends on production methods, they curb the sense of alienation that is inextricably bound up with their work – work that is extremely low-paid, invisible and held in low regard. This is concurrent with the suggestion of Victor Turner and Richard Schechner that a positive feedback exists between the cultural and organizational aspects of a performance.28 If this aspect of Performance Studies were to be taken seriously, and our attachment wasn’t so strong to the utopian independence of theatre critics in the traditional understanding of the term, we’d be forced to concede that it is craftspeople and other actors in the production process that have the necessary expertise to offer a competent assessment of a theatre production. He would never have drawings – just sketches or a painterly vision. I had to try to sense what he wanted, even though I don’t think he knew it all himself. But unlike stage designers today, he was always there, talking to us. I remember he’d often come over and say: ‘I say, you did it brilliantly, but you know what? Do it all over again because that’s not what I thought’. And you were furious because you’d made an effort and still missed the point. But he said it in a way that still made you feel respected. And besides, I knew I was taking part in a great thing, which would allow me to touch something I’ve never touched before. He was a thoroughly decent man, very emotional about his work. I. is not alone in remembering Grzegorzewski in this vein; similar remarks go against the grain of the stereotypical image of a craftsperson as a traditionally minded individual in thrall to realism in theatre. On the contrary, most of my interviewees including those who had never worked with Grzegorzewski emphasise that what matters most in theatre is its creational aspect. Asked how she feels about contemporary stage design, Z. replies: ‘Theatre is an illusion. You only need to do enough to produce the right effect, that’s all. The audience needs an inner experience, not an absolute truth’. As for M., she makes this appeal: ‘A plain table – everyone’s got that at home. The world on stage needs to be unreal, like in a fairy tale. Let it be theatrical: strange, artificial, mysterious’. If you are theatre-minded – you’ve got this vision of the whole and know that the workshop is needed to create a whole world [my emphasis] – you’ll keep the workshop. But if you’re an economist and see people sitting around doing nothing for two weeks because there’s a break in the production cycle – you’ll close the workshops down. By juxtaposing a ‘theatre-minded’ attitude with the view of ‘an economist’, M. makes a distinction between two kinds of theatre: stage design recycling, or adjusting ready-made products to the requirements of the stage, and theatre as universe, with the work of highly qualified craftspeople at its core. Crucially from the point of view of the present text, neorealism determined a specific production model. Because it recognised a variety of styles and conventions, neorealism required craftspeople specialising in different fields to work closely alongside one another, each of them capable of employing a variety of techniques and prepared to go beyond their specific field in order to create a joint, coherent work, in close collaboration with a stage designer whose status at the time was almost equal to that of a director. 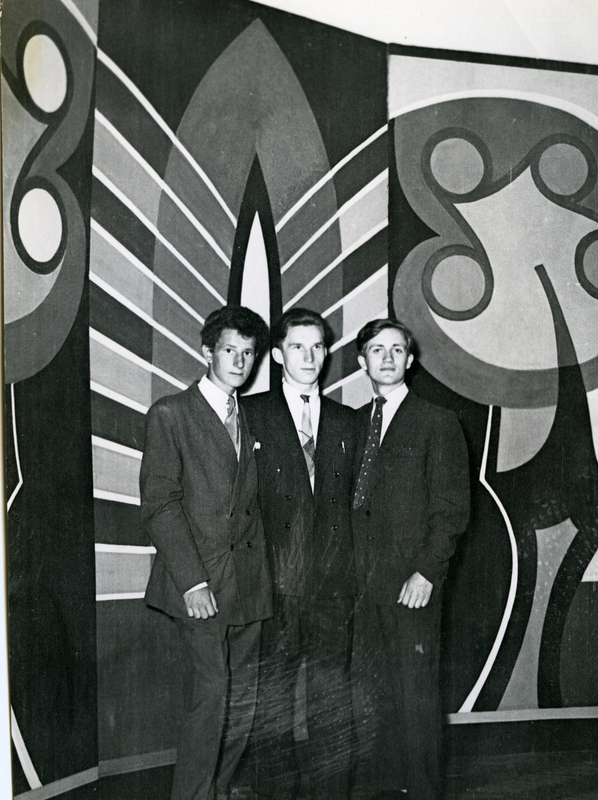 Students at the State School for Theatre Technique majoring in decorative painting, in front of their graduation work, 1960s. Collection of Tadeusz Stawicki. 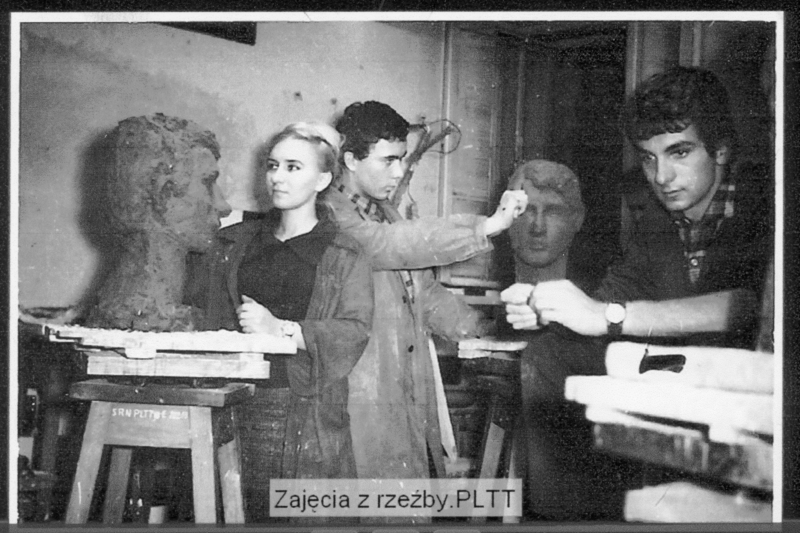 Student Krzysztof Kieślowski at the State School for Theatre Technique sculpture workshop, late 1950s/early 1960s. Collection of Bogdan Kąkol. I hope that this glance to the past will show with sufficient clarity that criticism levelled by craftspeople at the current production model takes as its point of reference not a utopian figment of the imagination but the actual aesthetic-production model which had been dominant in Poland’s post-war theatre for several decades (particularly in Warsaw). In that model, the artistic effect depended on the involvement of a diverse group of specialist craftspeople and on the stage designer being ‘firmly rooted’ in the production – hence the predominance held today by the director was to a large extent diversified. This study suggests that theatre ecosystems disintegrate and their internal diversity is on the wane. Craftspeople cite several reasons for this: neglect of working conditions; inadequate self-knowledge within the organization; lack of consultation; budget administration which antagonises staff and corrodes trade-union structures; and, finally, a mindless acceleration of the production processes, which leads to a rise in opportunistic behaviour and causes waste of money, materials and human resources. Inner resistance to decisions which deprive craftspeople of fulfilment in the field that is common to all employees around the world – the need to have agency and to be creative – is echoed in their critical comments. And it seems that resistance is well justified. Asked about the craftspeople’s negative attitude to second-hand costumes, a theatre director bridled: ‘Oh, they’d all like to be artists’.37 The disdainful tone of her comment indicates that, although directors aim to transform theatres into flexible, efficient institutions, they remain the product of former days, when it comes to hierarchy and social relations. As social analyst Katarzyna Abramczuk has rightly pointed out: ‘some psychologists attribute Poland’s low levels of satisfaction with democracy to attitudes of expectation, of taking everything for granted. [...] But analysing these authors makes it clear that satisfaction level are simply a function of how democratic institutions operate.’38 Similarly, the level of criticism among theatre craftspeople may well be directly proportionate to the dysfunctionality of the institution that employs them – however, a more in-depth empirical study would be needed to give substance to such a claim. What is certain is that their criticisms stem from tension between a historically shaped horizon and the quotidian experience of working in institutions – which doesn’t make their criticisms any less significant. Bitterness displayed by craftspeople refers us back to a model of theatre which has been abandoned, and whose preferred aesthetic values sanctioned the existence of craft workshops as a vital element of building a diverse world on stage. If one sought to verify craftspeople’s views, it would not be enough to confront them with the opinions of managing directors of theatres. As public debate on the future of craft in theatre has shown, institution directors will most likely be inclined to point to the ‘top’ – that is, to blame the state of affairs on the state allocating insufficient funds to the arts and forcing directors to cut jobs.39 If, on the other hand, one were to ask them about specific irregularities in matters on which they have the final say, one may run the risk of exposing (or at least hinting at) the identity of the informant, which may affect that informant’s subsequent relations with her superiors. Thus one would be better off assuming the role of a participating researcher, bearing in mind difficulties this inevitably entails. My experience tells me the presence of a theatre scholar as an evaluator participating in the process can at times be very undesirable indeed. not to distribute, without the Employer’s consent, in any form, any information available to the Contractor and pertaining to the Employer, which the Contractor will access in the course of carrying out her duties, and which are not intended, by the Employer, for public circulation, both during the course of this Agreement and after its termination. Płoski, Paweł, ‘Albo próby – albo obsada’, in Struktura teatru a struktura spektaklu. Wpływ systemu organizacji instytucji na estetykę przedstawienia w wybranych krajach europejskich, eds. Anna Galas-Kosil, Piotr Olkusz (Warsaw: Instytut Teatralny im. Zbigniewa Raszewskiego, 2016). 1. Zofia Smolarska, ‘Towards Sustainable Change. Craftsmanship in Polish Puppet Theatres – an Ecosophical Perspective’, in Puppet Theatre in the 21st Century, eds. Karol Suszczyński, Marzenna Wiśniewska (Warsaw: Akademia Teatralna im. A. Zelwerowicza). 2. Dyrektor miniatury nominowany w plebiscycie osobowość roku 2015, www.teatrminiatura.pl [accessed on 3 January 2017]. 3. Jóhannesson was founder and for fifteen years managing director of Iceland’s first professional independent theatre, the Hafnarfjörður Theatre, which gained international renown. 4. Thanks are due to the sociologists Prof. Małgorzata Melchior and Błażej Prośniewski, for pointing out similarities between my research methods and grounded-theory methodology. 5. Zofia Smolarska, ‘Uczeni rzemieślnicy’, Teatr 7–8/2015. www.teatr-pismo.pl [accessed on 2 May 2017]. 6. Kathy Charmaz, Constructing Grounded Theory: A Practical Guide Through Qualitative Analysis (London: Sage, 2006), p. 7. 7. Charmaz, Constructing Grounded Theory, p. 113. 8. Charmaz, Constructing Grounded Theory, p. 113. 9. Juliusz Osterwa, ‘Przemówienie do pracowników technicznych Teatru Letniego’, in Przez teatr – poza teatr. Wybór pism, eds. Ireneusz Guszpit, Dariusz Kosiński (Kraków: Towarzystwo Naukowe ‘Societas Vistulana’, 2004), pp. 98–100. 10. A statement by Grzegorz Jarzyna during the debate ‘Rewolucja? Jaka Rewolucja?’', on 16 January 2017 at the Zbigniew Raszewski Theatre Institute in Warsaw, moderated by Roman Pawłowski and Dariusz Kosiński. 11. See Anna Gmiterek-Zabłocka, Znany warszawski teatr nie płacił za nadgodziny. Przegrał w sądzie. Ratusz nic o tym nie wiedział, Tok FM, 4 lipca 2017, www.tokfm.pl accessed on 18 lipca 2017. 12. Suzi Gablik, The Reenchantment of Art (New York: Thames Hudson, 1992), p. 8. 13. See the 'Ludzie Teatru' outdoor exhibition on Royal Łazienki Park in Warsaw, featuring photos of theatre craftspeople and other ‘invisible’ staff members of the Wielki Theatre–National Opera; the film referred to shows the centenary of the Polski Theatre in Warsaw: www.youtube.com [accessed on 2 May 2017]. 14. Richard Sennett, The Crafsman (New Haven, London: Yale University Press, 2008), p. 9. 15. Jerzy Gumiński, Przemijają lata, zostają teatry (Łódź: self-published, 2006), p. 107. 16. Peter Senge’s term. See The Fifth Discipline: The Art and Practice of the Learning Organization (New York: Doubleday, 1990). 17. Paweł Płoski, ‘Reforma! Reforma!’, a speech to the second congress of the Polish Association for Theatre Studies in Bydgoszcz in 2015, www.ptbt.e-teatr.pl [accessed on 4 February 2017]. 18. In 2015, the Solidarity trade union officially announced it would be supporting presidential candidate Andrzej Duda, and many union activists were parliamentary candidates from Duda’s Law and Justice party. In addition, Solidarity joins forces with the Polish nationalist movements in organizing marches and picket lines: for example protests against the climate summit. 19. Renata Pęciak, ‘Interpretacja fordyzmu i postfordyzmu w teorii regulacji’, Studia i Prace Wydziału Nauk Ekonomicznych i Zarządzania, 35:2, 2014, pp. 176–177. 20. Mikko Kuussaari, et al., ‘Extinction Debt: A Challenge for Biodiversity Conservation’, Trends in Ecology Evolution, 24.10, 2009), www.cell.com [accessed on 1 February 2017]. 21. Dziennik Ustaw nr 184, poz. 1240 [Polish Journal of Legislation no. 184, item 1240]. 22. See Kuba Szreder, ‘W obiegu. Strukturalny oportunizm jako sposób urządzenia pracy i życia uczestników artystycznej cyrkulacji’, Czas Kultury, 3, 2016, English version available: ‘In Circulation. Structural Opportunism as a Method of Organizing Work and Life of the Participants of Artistic Circulation’, trans. by Justyna Chada, czaskultury.pl/en [accessed on 12 August 2017]. 23. Katarzyna Wojnar, Polska klasa kreatywna (Warsaw: Narodowe Centrum Kultury, 2016), p. 206. 24. Wojnar, Polska klasa, p. 175. 25. Szreder, ‘In Circulation. Structural Opportunism’, p. 20. 26. Szreder, ‘In Circulation. Structural Opportunism’, p. 21. 27. Szreder, ‘In Circulation. Structural Opportunism’, p. 21. 28. See Jon McKenzie, Perform or Else: From Discipline to Performance. (London, New York: Routledge, 2001), p. 91. 29. See Zbigniew Raszewski, ‘Wstęp’, in Leon Schiller, Teatr ogromny, ed. Zbigniew Raszewski (Warsaw: Czytelnik, 1961), pp. xiii–xiv. 30. Zenobiusz Strzelecki identifies a 1930 production of Victory by Joseph Conrad (adapted by Schiller, with stage design by Władysław Daszewski, at the Rozmaitości Theatre in Lviv) as the earliest example of neorealist theatre. See Zenobiusz Strzelecki, Polska plastyka teatralna (Warsaw: PIW, 1961), 3, p. 399. 31. Zofia Smolarska, ‘W służbie teatru-prototypu. Przyczynek do dziejów Państwowego Liceum Techniki Teatralnej’, in Rzemiosło teatru. Etos – profesje – materia, eds. Agata Dąbek, Wanda Świątkowska (Kraków: Teatr Łaźnia Nowa, Księgarnia Akademicka, 2015), pp. 57-74. 32. Jan Kosiński, ‘List do redaktora Grenia, czyli De scaenographia nostra nihil bene’, in Jan Kosiński, Kształt teatru (Warsaw: PIW, 1984), pp. 56–57. 33. Paweł Płoski, ‘Albo próby – albo obsada’, in Struktura teatru a struktura spektaklu. Wpływ systemu organizacji instytucji na estetykę przedstawienia w wybranych krajach europejskich, eds. Anna Galas-Kosil, Piotr Olkusz (Warsaw: Instytut Teatralny im. Zbigniewa Raszewskiego, 2016). 34. Zenobiusz Strzelecki, Współczesna scenografia polska (Warsaw: PIW, 1983), p. 14. 35. Director Maciej Wojtyszko in conversation with the author, 16 March 2015. 36. Heiner Goebbels, ‘Przeciw Gesamtkunstwerk. Ku różnicy sztuk’, trans. by Anna R. Burzyńska, in Goebbels, Przeciw Gesamtkunstwerk, ed. by Lukáš Jiřička (Kraków: Korporacja Ha!art, 2015). 38. Katarzyna Abramczuk, ‘Zaufanie do instytucji polskiego państwa’, in Instytucje, konflikty i dysfunkcje, ed. Maria Jarosz (Warsaw: Oficyna Naukowa-Instytut Studiów Politycznych PAN, 2012), p. 275. 39. A statement made during the 2013 panel ‘ROZMOWA NIE-KONTROLOWANA – Pracownie, won z teatru!’, moderated by Olga Byrska at the Zbigniew Raszewski Theatre Institute in Warsaw, www.youtube.com [accessed on 4 February 2017].